He's obsessive. He's compulsive. He's Monk, "TV's most original sleuth ever" (Howard Rosenberg, Los Angeles Times). Primetime Emmy® and Golden Globe® winner Tony Shalhoub cleans up crime and grime galore in the beloved series that critics hailed as "fresh, exciting and utterly original" (Chicago Tribune). Once upon a time Adrian Monk was a rising star with the San Francisco Police Department, but he lost his nerve, his mind and then his badge. Now, this obsessive-compulsive detective is determined to get back on the force by solving one crime at a time in "the best detective show to come along in decades" (New York Post). 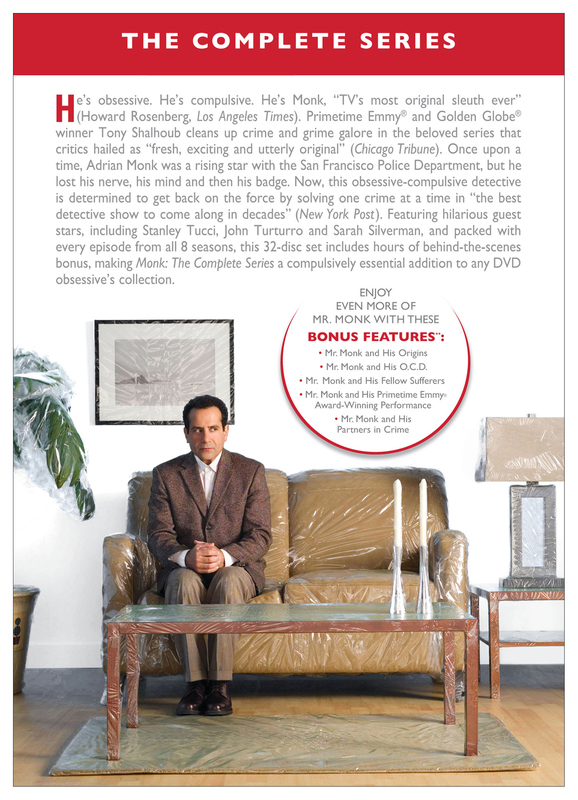 Featuring hilarious guest stars, including Stanley Tucci, John Turturro and Sarah Silverman, and packed with every episode from all 8 seasons, this 32-disc set includes hours of behind-the-scenes bonus, making Monk: The Complete Series a compulsively essential addition to any DVD obsessive's collection.